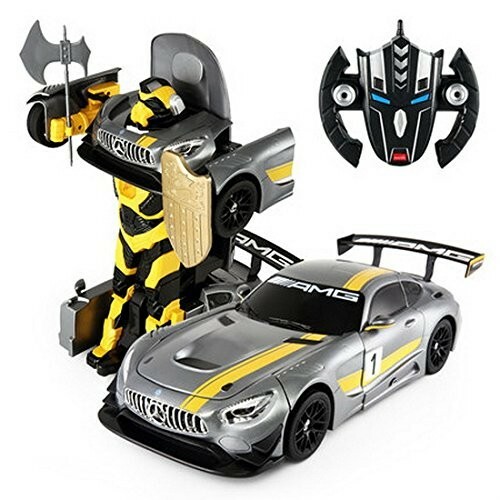 Master Box Dimension : 18" X 14" X 16"
This Mercedes Model is a two in one action figure toy! You can press one button on the remote and watch as the sleek AMG GT3 transform into a giant robot. This giant robot is ready to take action and defend the bad guys with it's might axe and shield. Controlling the model car and robot is simple, you can command it to go forward, backward, right, or left! This is what German ingenuity is all about! One press of a button and the model car will transform into a robot machine! Built-in realistic headlights that turns on and the acceleration of the R./C vehicle sounds just like the super car itself. The Robot will wield it's might axe and shield to defend from any bad guys!